The lessons learnt from an RMIT design studio based in an indigenous community were the focus of this month's words @ bldg 50 talk. A crowd of over 50 turned out on a chilly June night to see Brendan Jones (Antarctica Architects) and Ian Watts (former General Manager of the Australian College of General Practitioners, now a full-time architecture student) present their experiences. 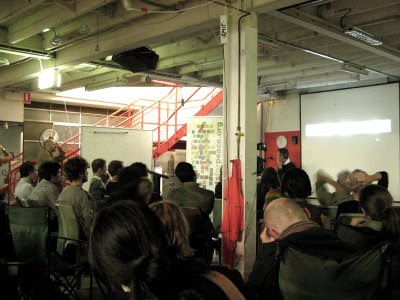 Brendan and Ian have run three community-engaged design studios at RMIT since 2007, each unique, but generally linked by a use of design as a means of improving healthcare environments. The talk focused on the 2008 'Home away from home' studio that set a group of 10 students the daunting task of designing a health clinic for the remote Northern Territory indigenous community of Ampilatwatja. This challenging project received an enthusiastic response from the audience. Students from the studio fielded tough questions in regard to their design response and the challenges of designing for a community with its own deeply-rooted and complex system of values and needs without imposing Western assumptions and aesthetics. Thanks to all who participated for a memorable and insightful discussion and to Brendan, Ian and students for their active contribution to the work in progress of bridging the divide between indigenous and non-indigenous populations and restoring cultural and physical health to Aboriginal communities. 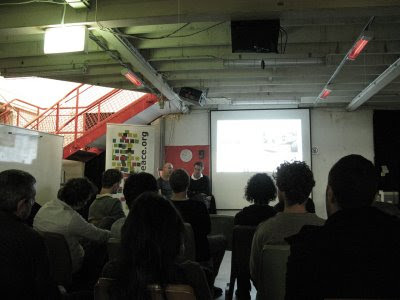 A video recording of the talk will be available on the website soon and we intend to present more projects addressing this theme in 2010, so stay tuned. In the meantime, we hope you'll join us next month, when anthropologist Dr Maree Pardy will look at urban renewal + revitalisation approaches in Footscray and Dandenong.